·NEW - Innovative Adjustable 4 Legs EXTEND for Use on Uneven Ground. 【360° FULL ANGLE MAGIC RETRACTABLE FOOT PAW】 : This VINGLI Pro Camping Chair adapt new 360° full angle magic foot pad which allows you place it in any environment, tidal flats/Lotus Pond/Intertidal Zone/Reservoir, mastered all rough terrain. The FOOT are retractable and foldable. You could fold it up when not use and storage it easily. The FOOT could be elongated up to 4.7inch at most. 【0~180° ADJUSTABLE RECLINING PADDED BACK FISHING STOOL】: Support 0~180° full angle adjust to meet you need. You could storage it in our durable FREE carry bag easily. Also it could be lay completely flat, and give better experience. 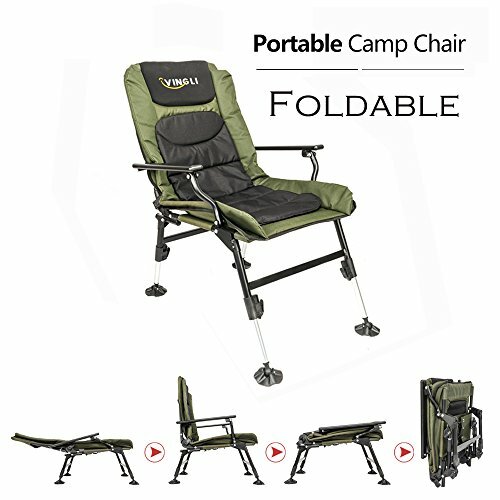 【ALL STEEL LEGS & ARMREST PROVIDE BETTER STABILITY】: This VINGLI Pro Camping Chair use new high quality steel legs and armrest to provide you better stability. All 4 legs are foldable that allows you storage it in anywhere. 【NEW TYPE BREATH BACK MESH PAD】: This new type breath back mesh pad gets you rid of the heat in summer day. Also you could use additional free soft insulated pad in cold days. The Pad are fixed by Velcro, and you can take off & on easily. 【IDEAL FOR INDOOR OR OUTDOOR USE】: This VINGLI multi-function foldable chair could be apply to indoor or outdoor. Any problem please don't hesitate to contact with us, we will resolve all your problem ASAP. We offer efficient customer service and technical support 24hrs to help any problem you meet. If you have any questions about this product by VINGLI, contact us by completing and submitting the form below. If you are looking for a specif part number, please include it with your message.